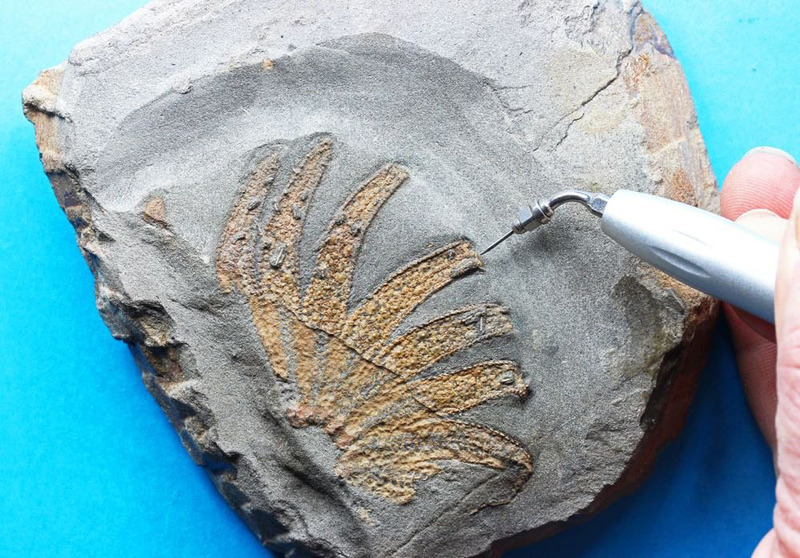 For intact, articulated preservation, fragile animals like starfish and crinoids need fast embedding, because decay sets in quickly, e.g. 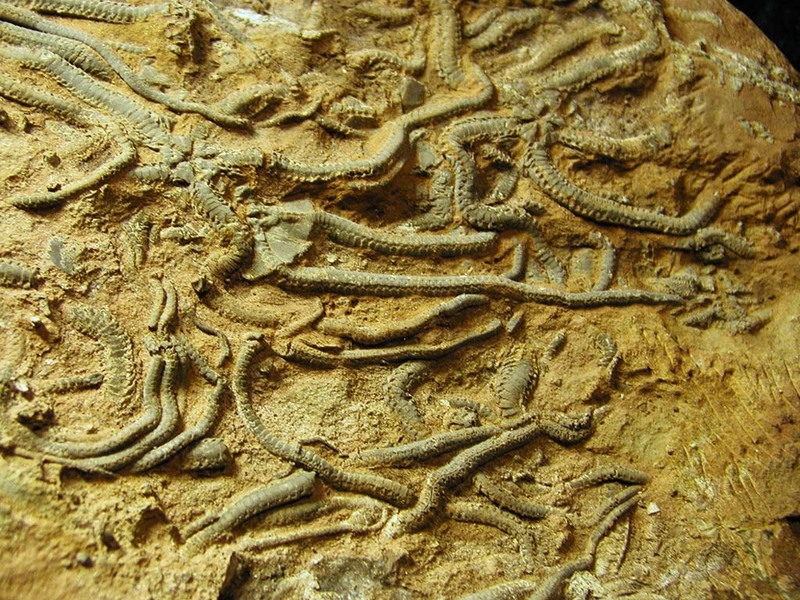 for brittle stars, already after half a day. 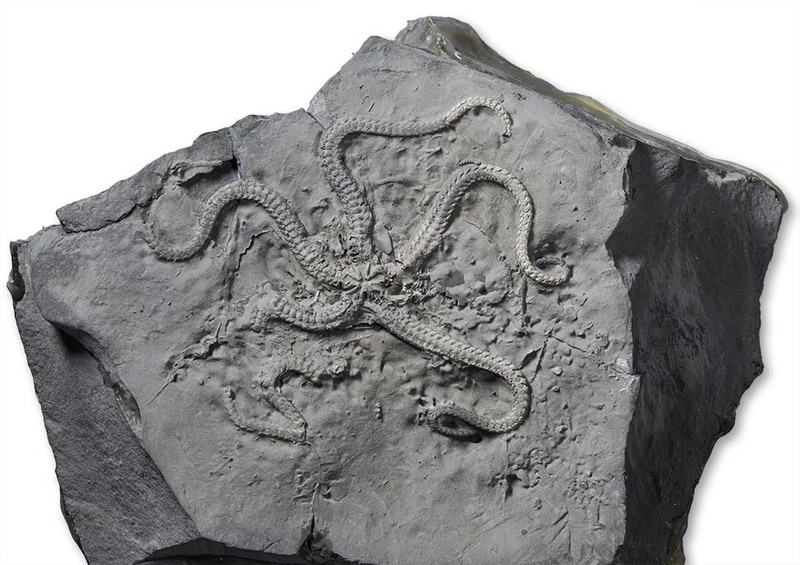 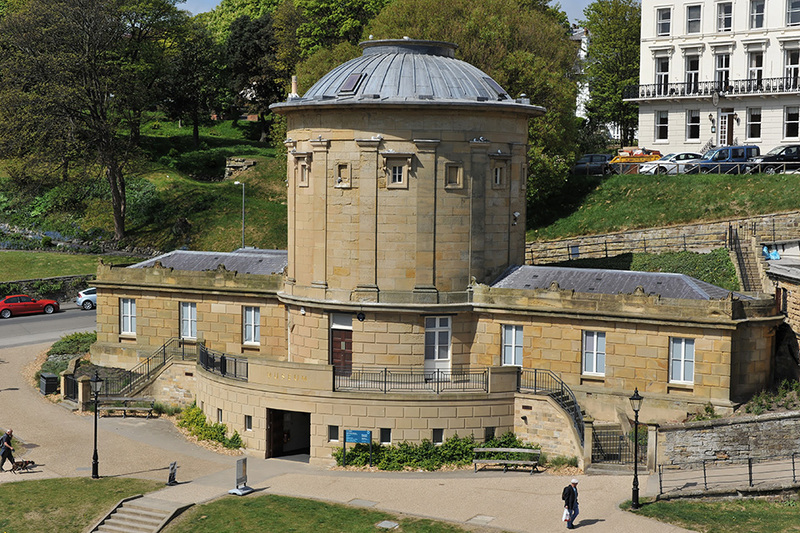 Brittle stars cannot free themselves when they´re suddenly covered by more than 5 cm of sediment – most of the brittle star fossils on the Yorkshire coast have probably been created by rapid burial in sediment, like a sediment avalanche – truly a moment frozen in time. 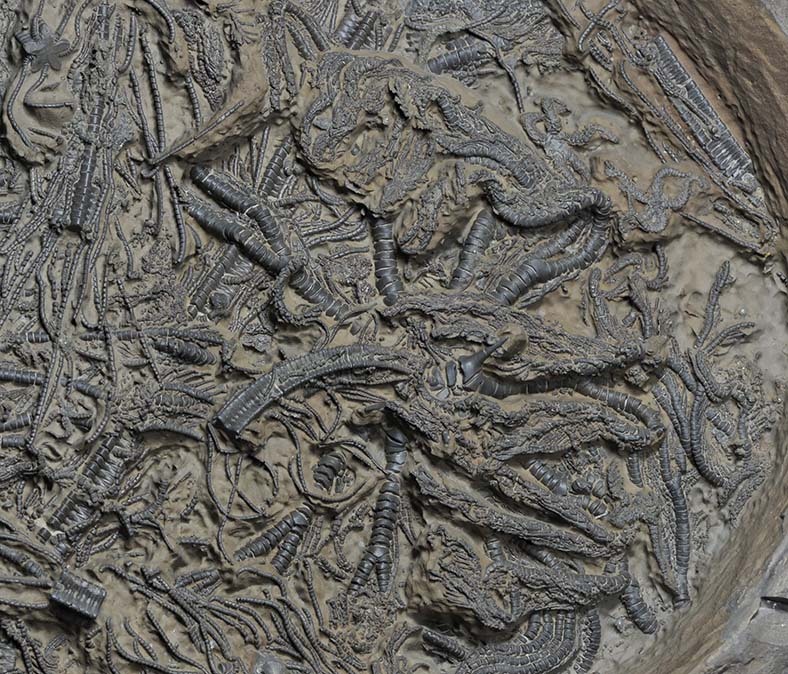 Some of the crinoids that can be found articulated are thought to have been deposited in scour troughs. 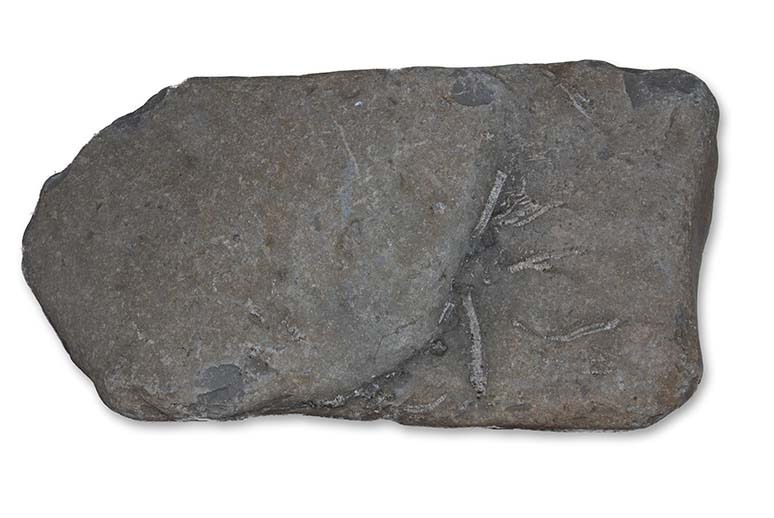 Still – “greatest liklihood” does not mean they’re common fossils, finding an articulated crinoid or starfish remains a great rarity. 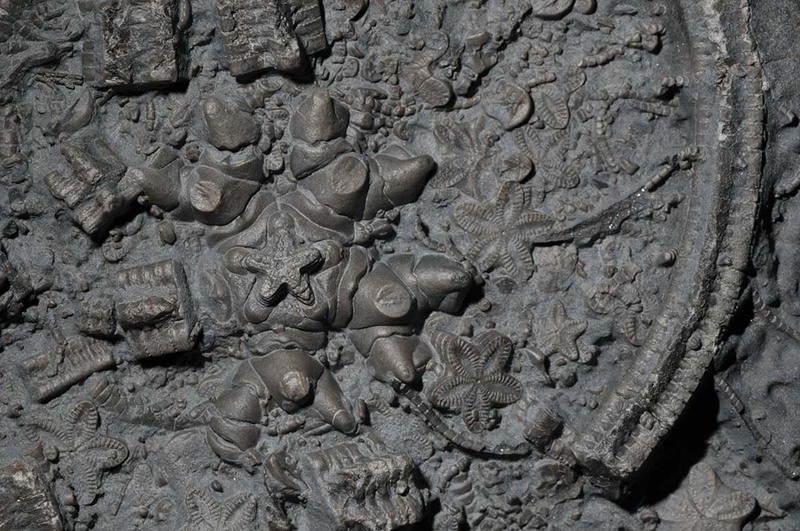 The falciferum zone is the odd one out here, since benthic conditions were mostly anoxic during this time (very little oxygen at the bottom) – so there are no starfish, and crinoids that occur were usually attached to drifting logs at the surface of the sea. 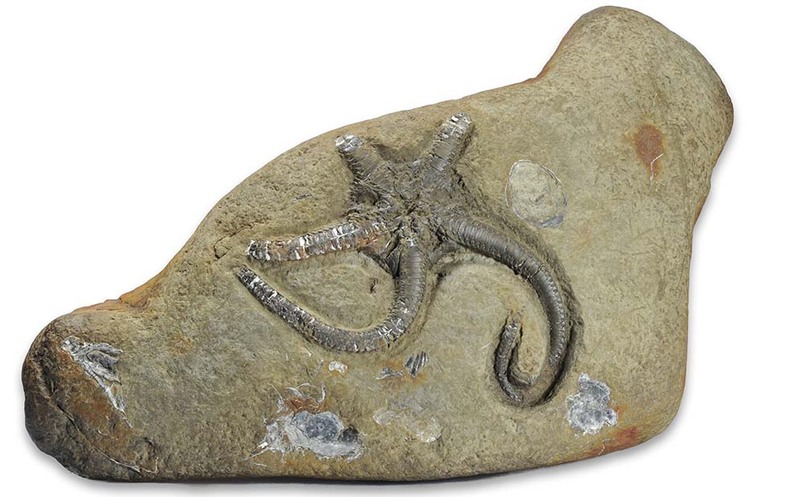 So the crinoids and starfish I’m showing you here now really represent more than 20 years collecting – please do not get the impression that fossils like these can be found on a day’s trip to the coast – unless of course you are extremely lucky ! 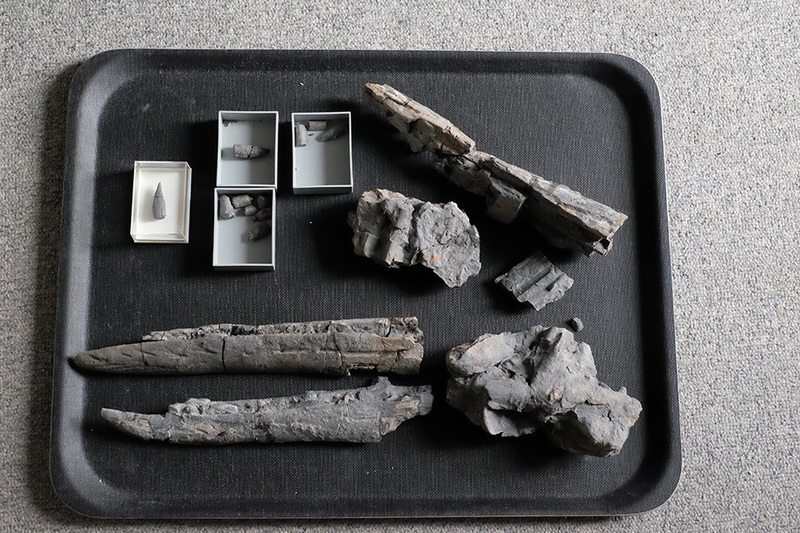 Some of these have been purchased, some reside in collections other than my own and are pictured here by kind permission of their respective owners – you will see that in the notes for the fossils. 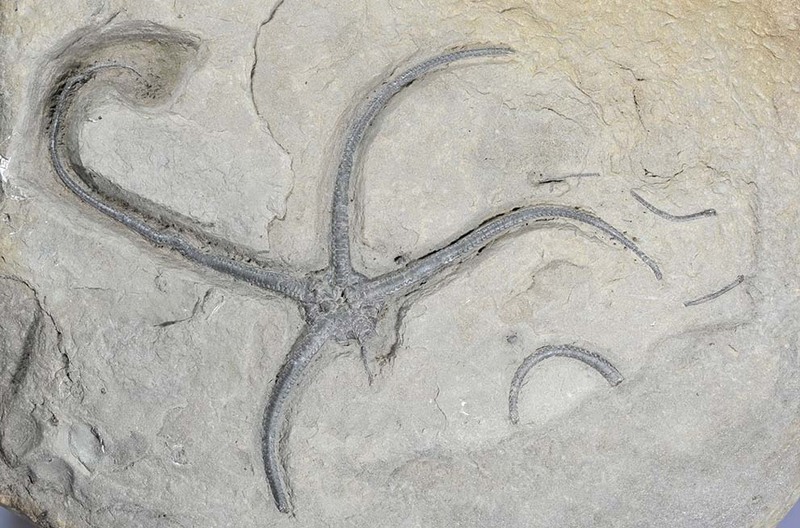 Generally preparation of starfish and crinoids most of the time is a difficult and time consuming task. 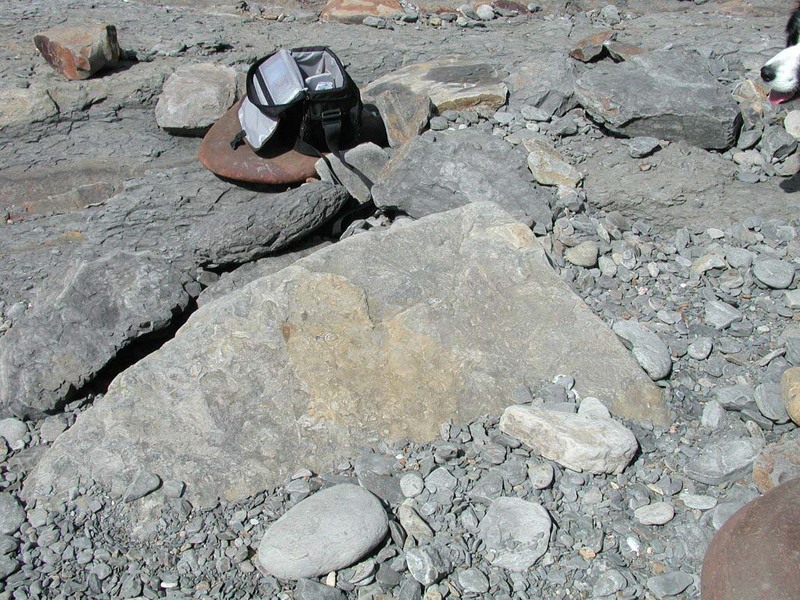 Their delicate structures are usually firmly embedded in the sediments and can only be retrieved if there is a difference between the surrounding matrix and the fossils which are usually preserved as calcite or pyrite. 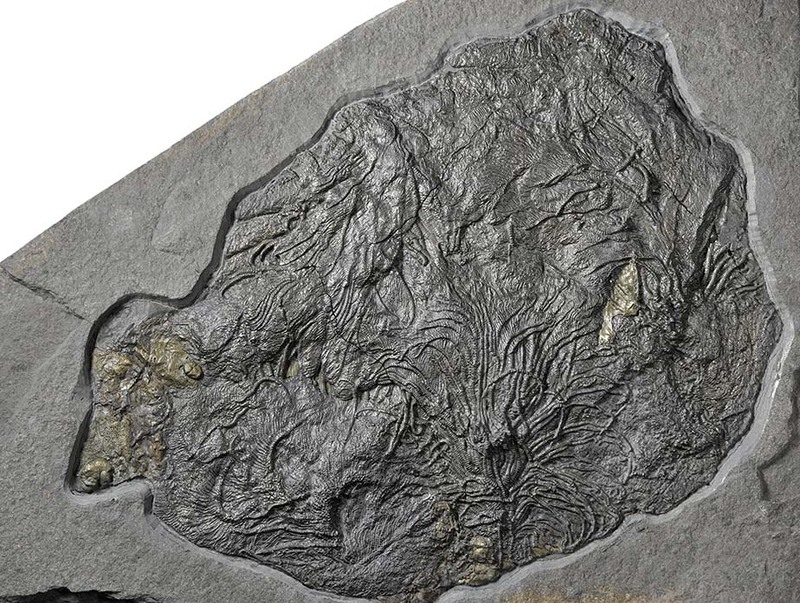 This difference can either be a difference in hardness, when the fossils are harder than the matrix – these fossils can be prepared mechanically, i.e. 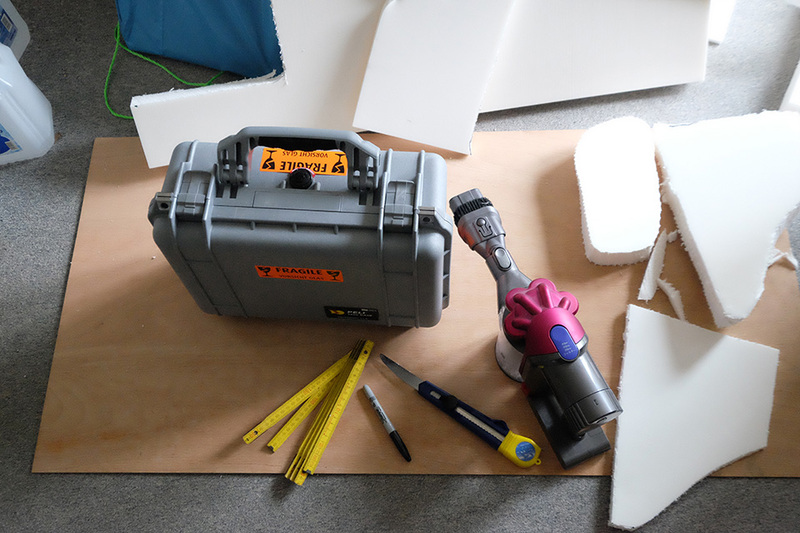 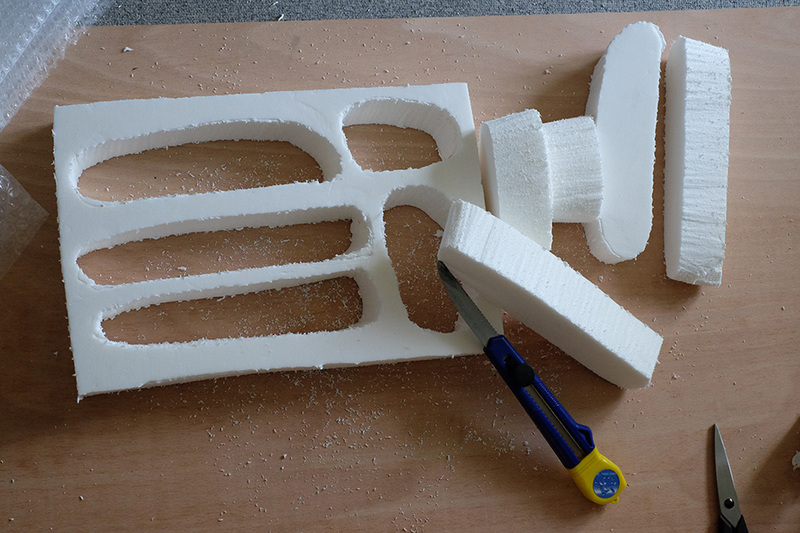 needles, airpens or – you might have guessed – air abrader. 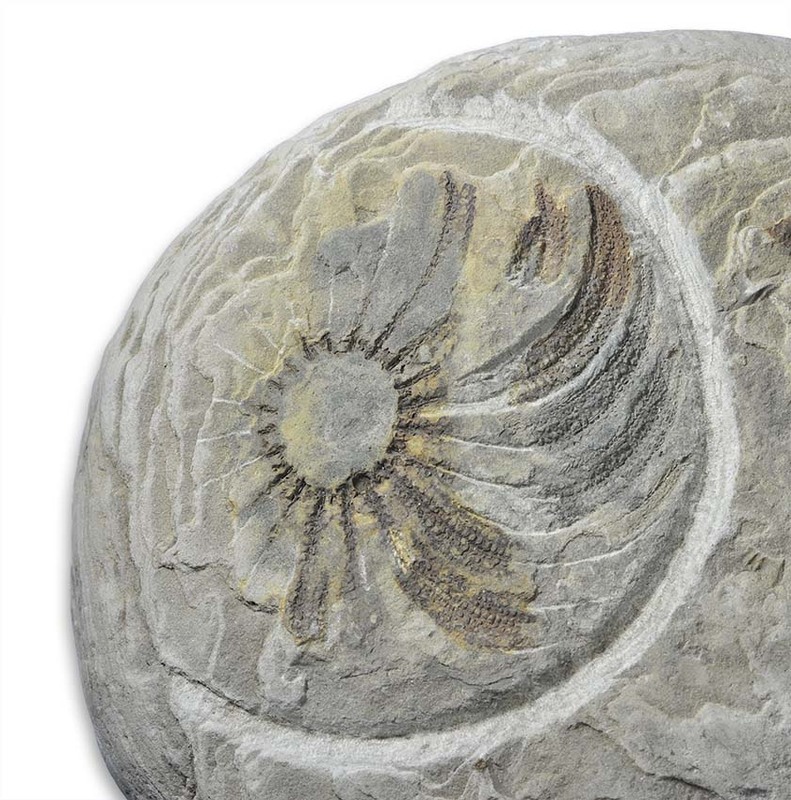 If there is no difference in hardness, there can also be the option of chemical preparation – when the fossils are more resistant to certain chemicals like acids or alkaline solutions than the matrix. 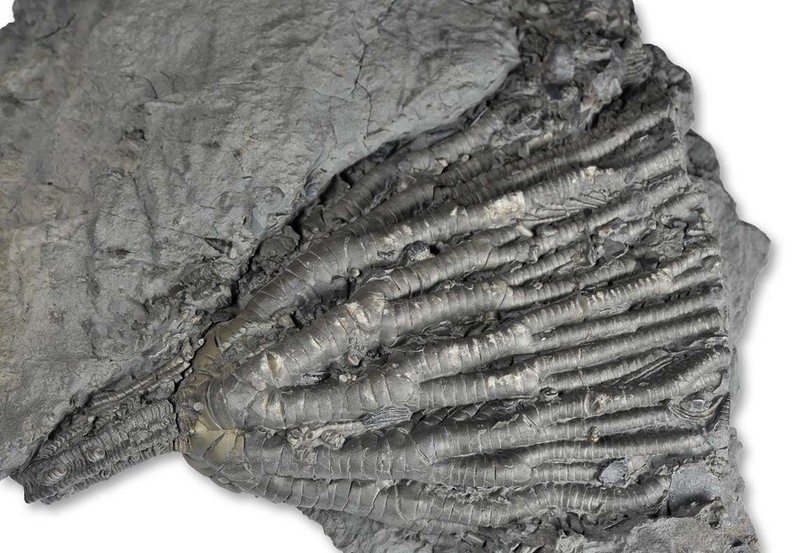 In rare cases, the environment (or rather what we put into it – sulphur dioxide / nitrogen dioxide from burning fossil fuels reacting with water to form sulfurous/sulfuric resp. 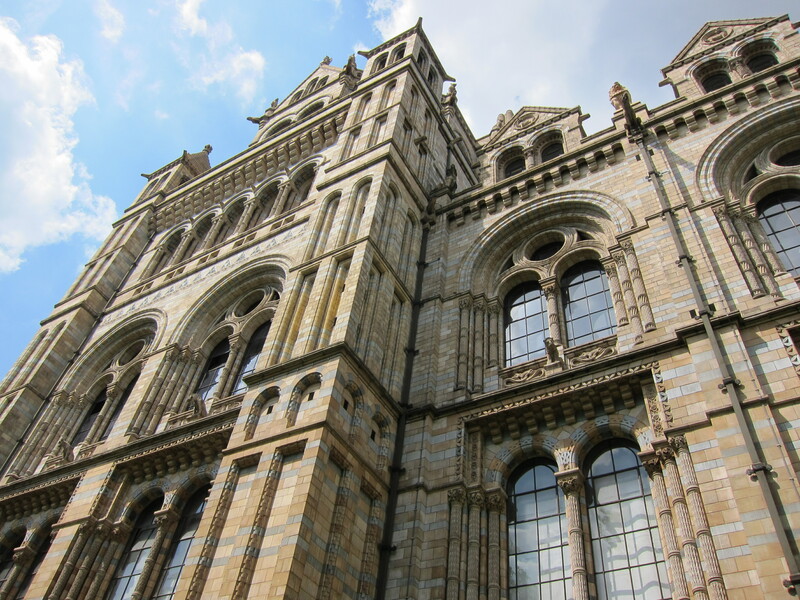 nitric/nitrous acid) or certain naturally occuring humic acids can do the job for us – but that is only really the exception. 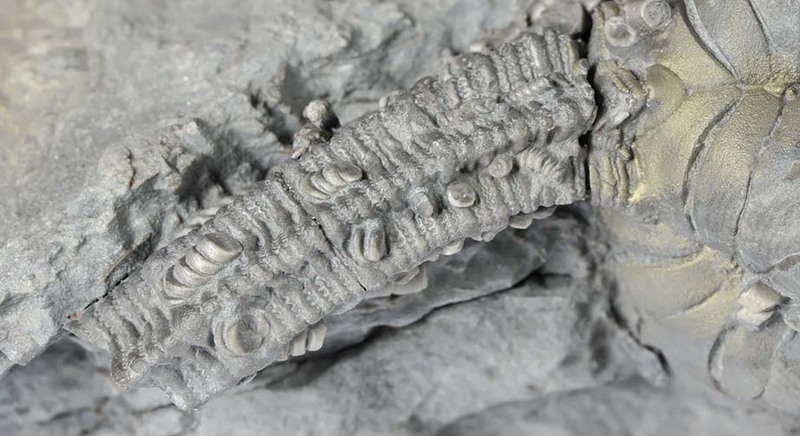 This is one of the first more or less articulated crinoid crowns I´ve found on the Yorkshire coast. 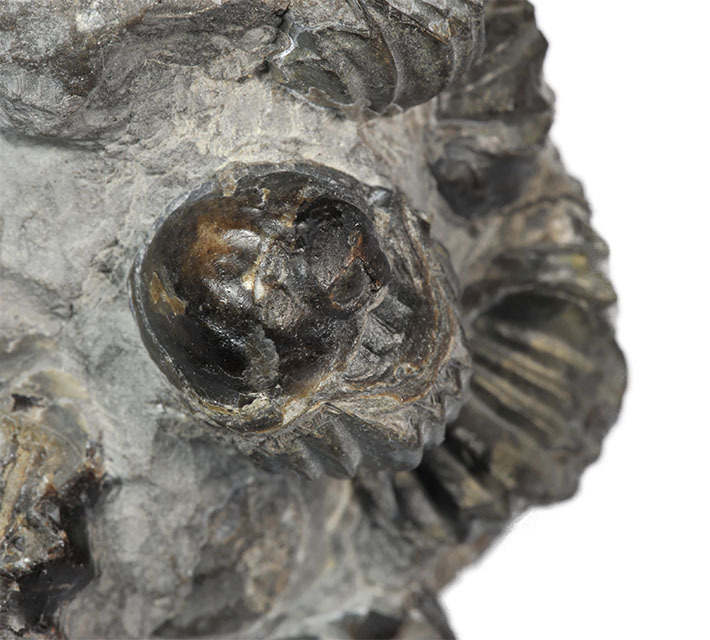 with an Oistoceras ammonite, which places the crinoid in the figulinum subzone of the lower Pliensbachian. 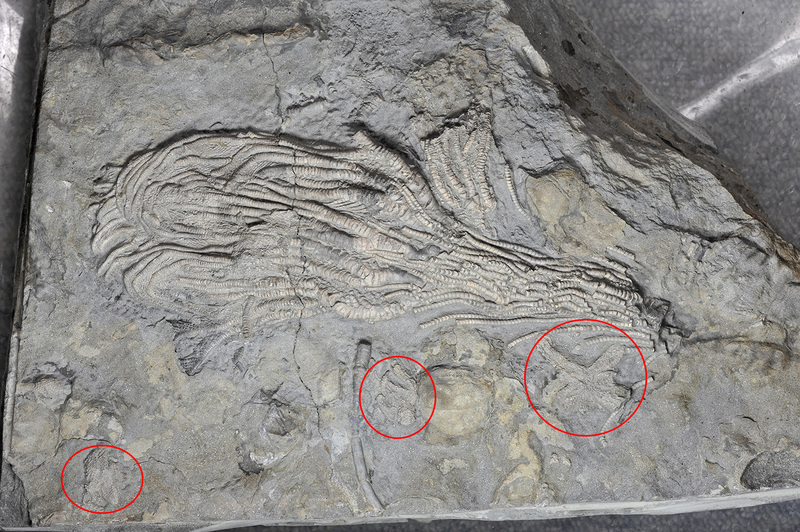 These crinoids only have a very short stem (only a few segments), which I´ve never found preserved so far. 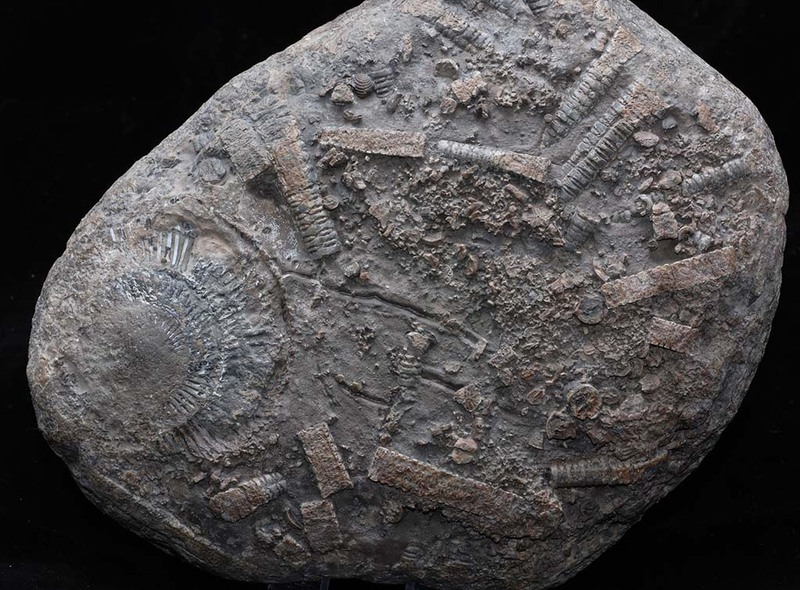 This is the crinoid specimen that really got me seriously started to try and collect all the known Yorkshire liassic crinoids. 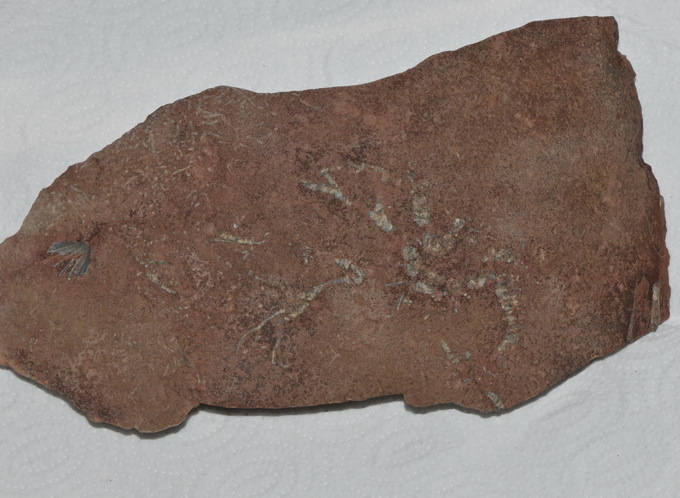 It was found on a very warm summers day in July 2007 when I was out collecting with friends and had found nothing at all up to this point – I picked up this 30 x 20 cm slab with some faint crinoid traces and put it in my bag so it at least felt like I had found something… At home I started prepping it with an air abrader (iron powder) and followed the visible arms of the crinoid into the rock. 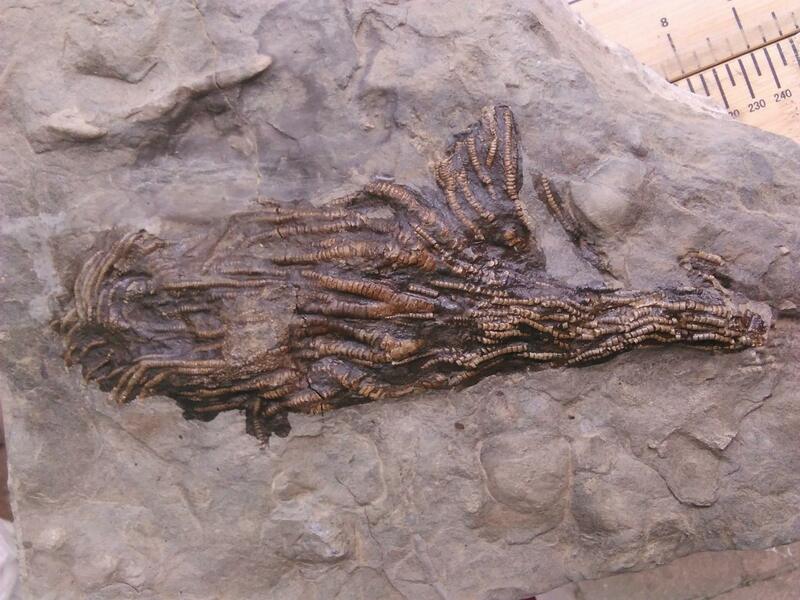 To my amazement more and more stems and arms appeared until after about 60 hours of prep work almost the whole slab showed a deathbed of multiple Hispidocrinus crinoids in an early state of decay. 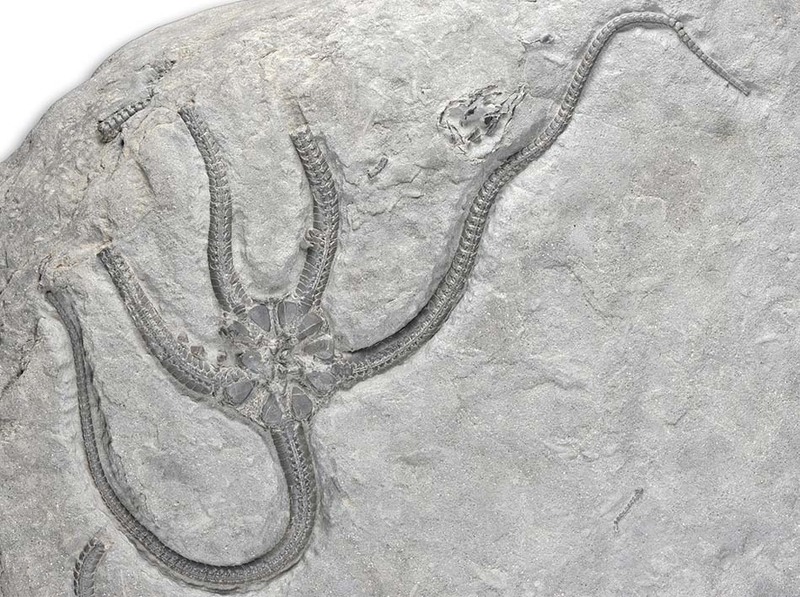 When looking carefully at the slab, you can even notice tiny little brittlestars that have either fed on the decaying crinoid or had used the crinoid to achieve a higher up filter feeding position or even benefit from the crinoids´excretions and got embedded with it. 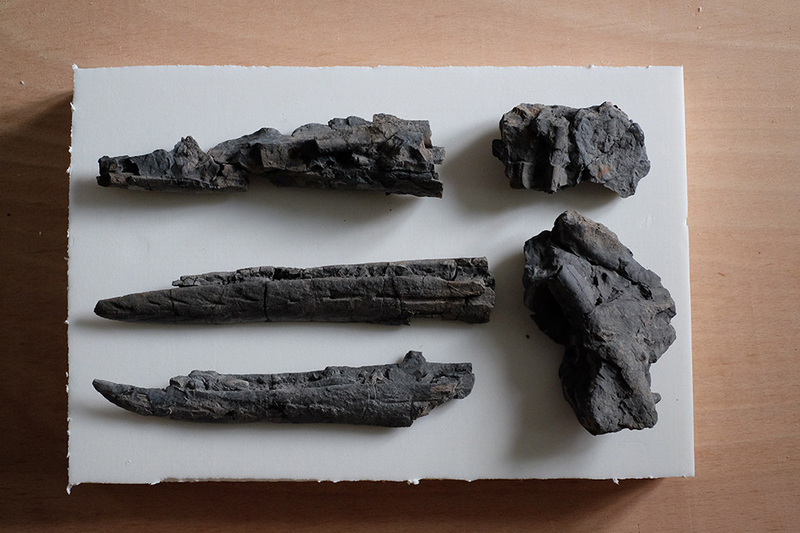 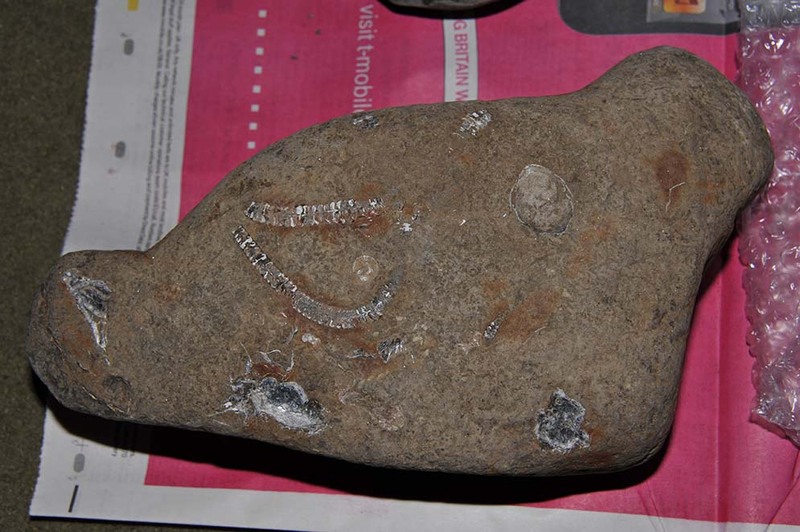 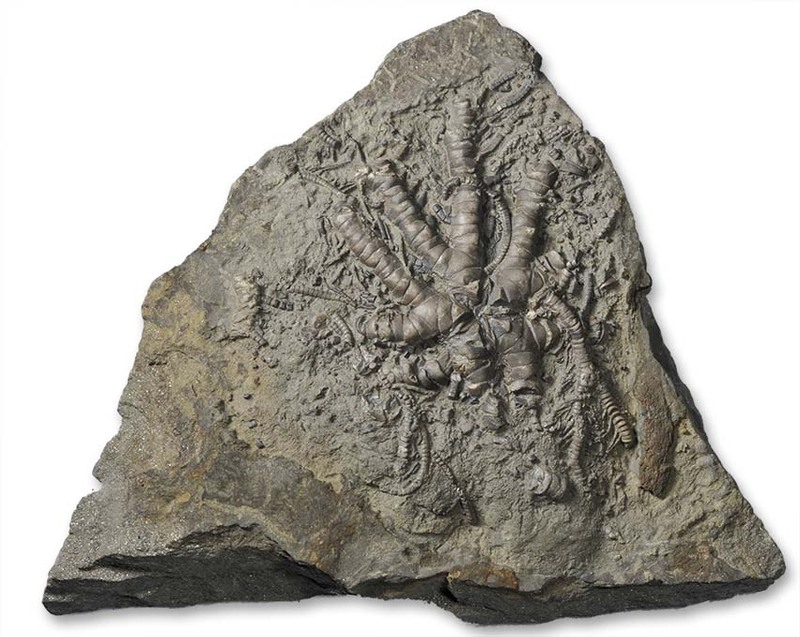 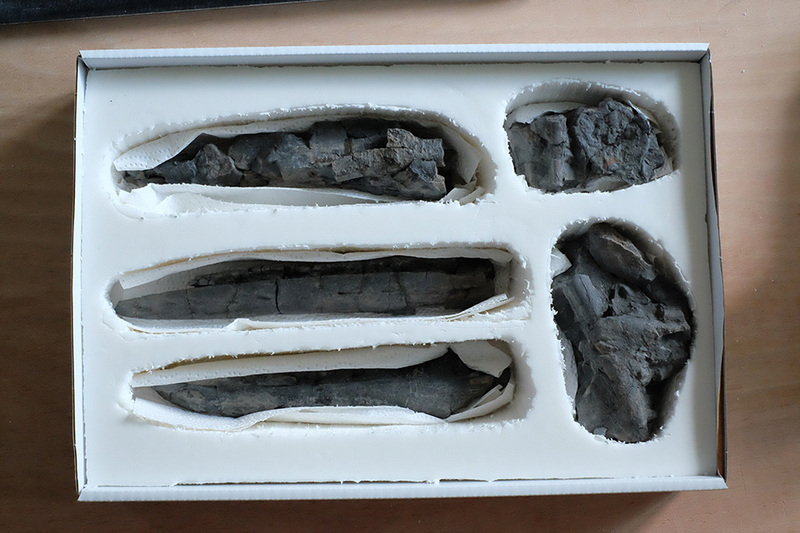 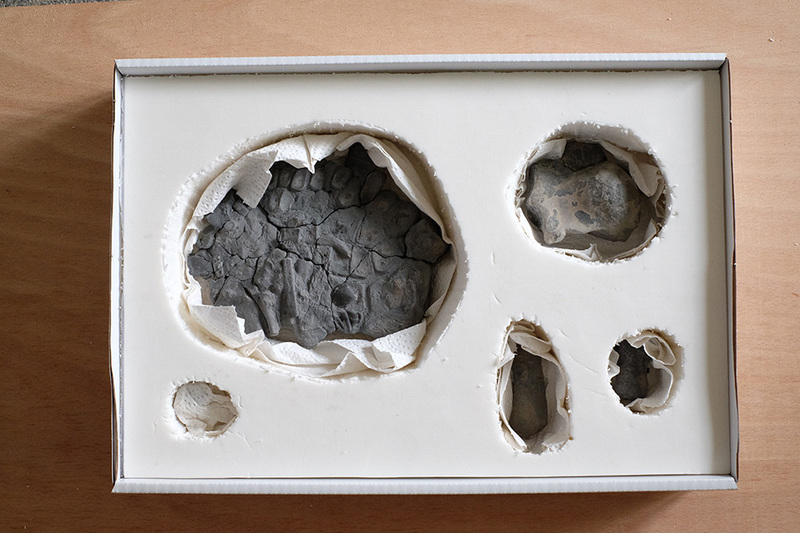 Another specimen was found in a small 12 x 15 cm which was initially split after finding it since the outside did only show very faint crinoid traces. 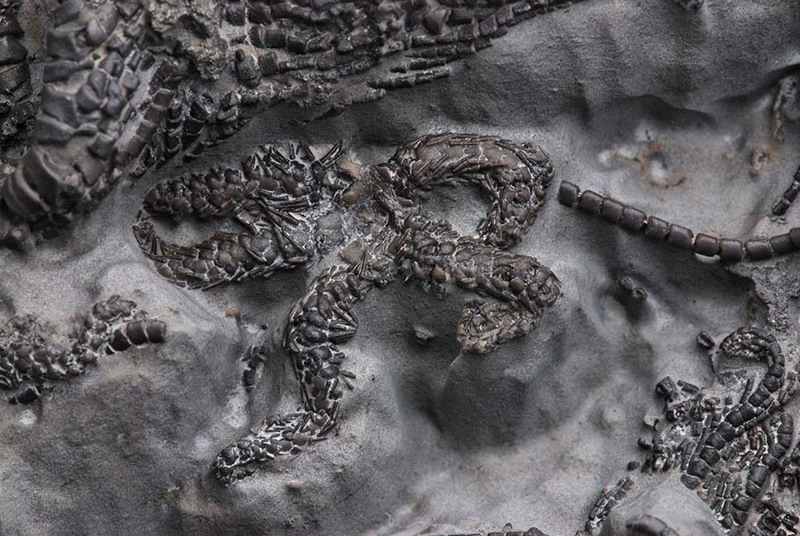 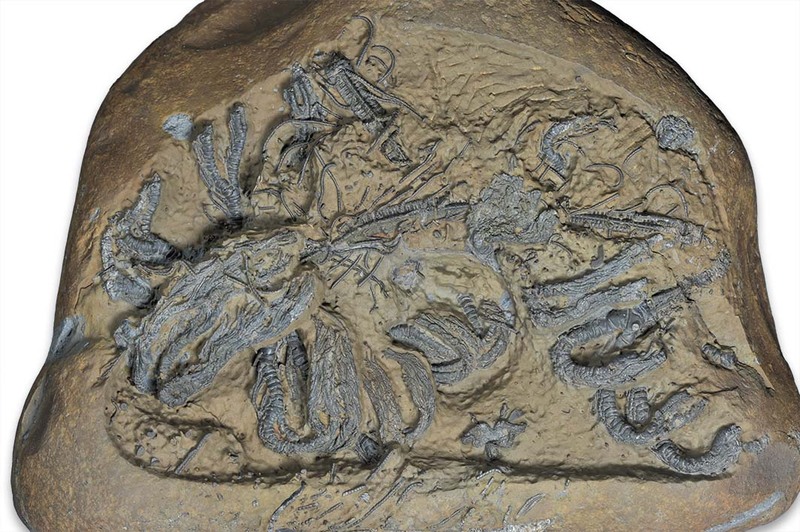 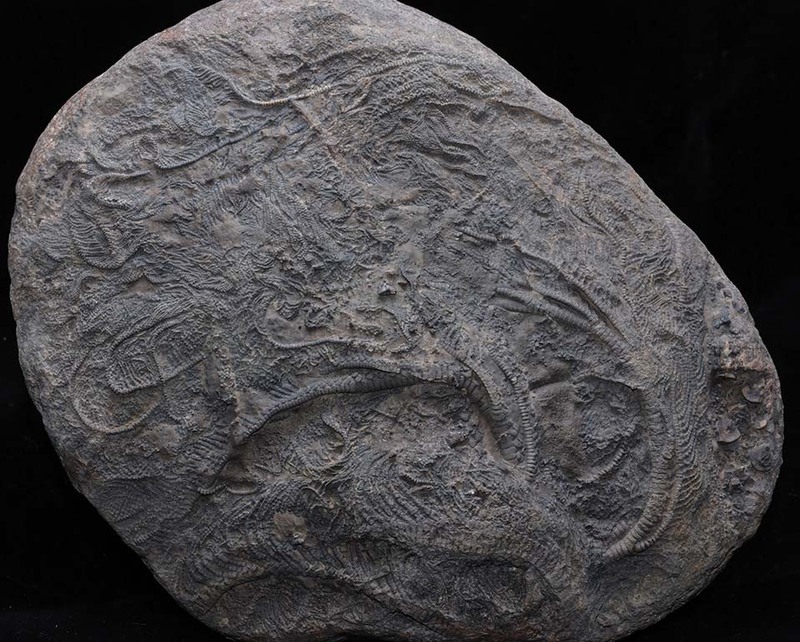 As the split showed a crinoid inside, it was glued back together again and air abraded in about 20 hours. 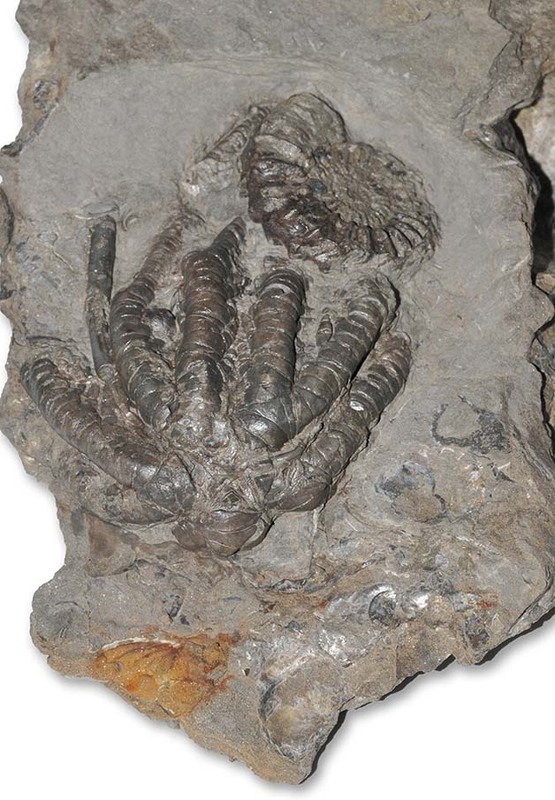 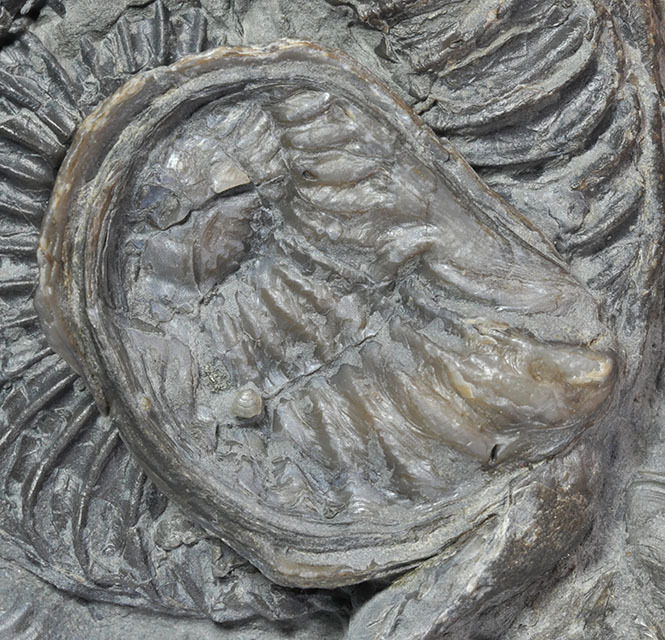 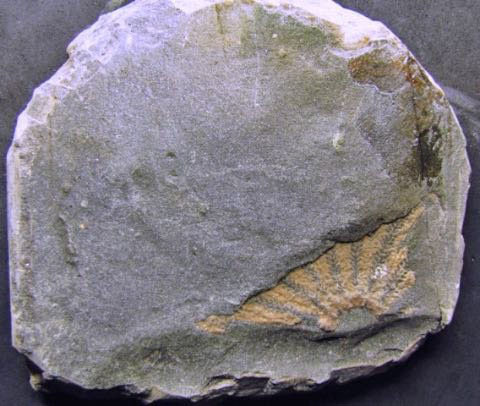 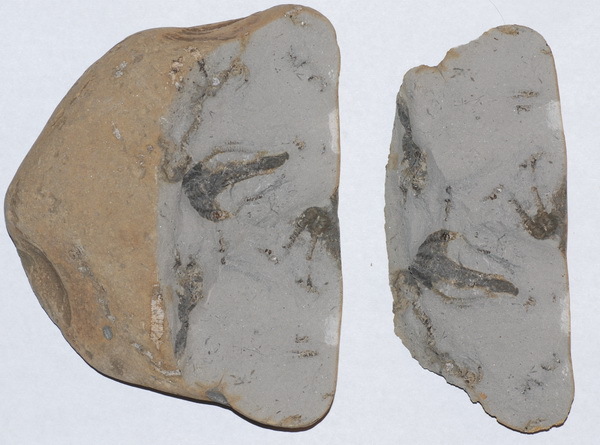 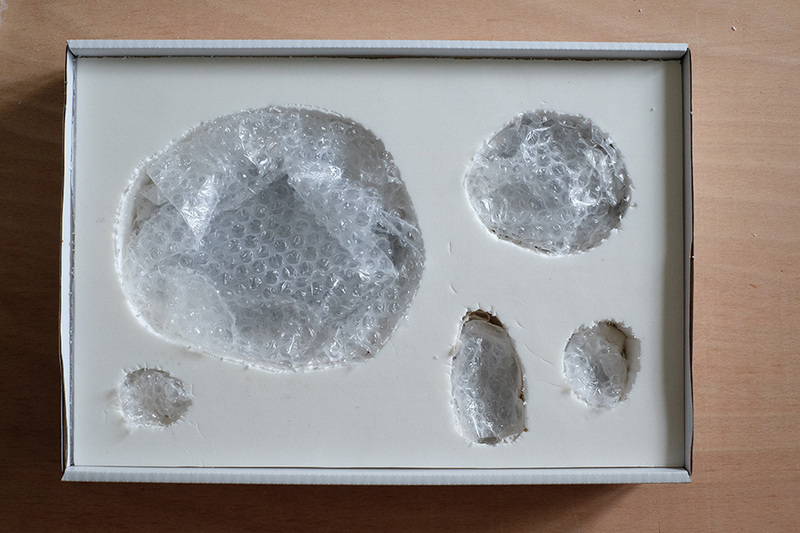 This lens comes from the tenuicostatum zone of the lower Toarcian and shows remains of Seirocrinus subangularis and was prepared using an air abrader. 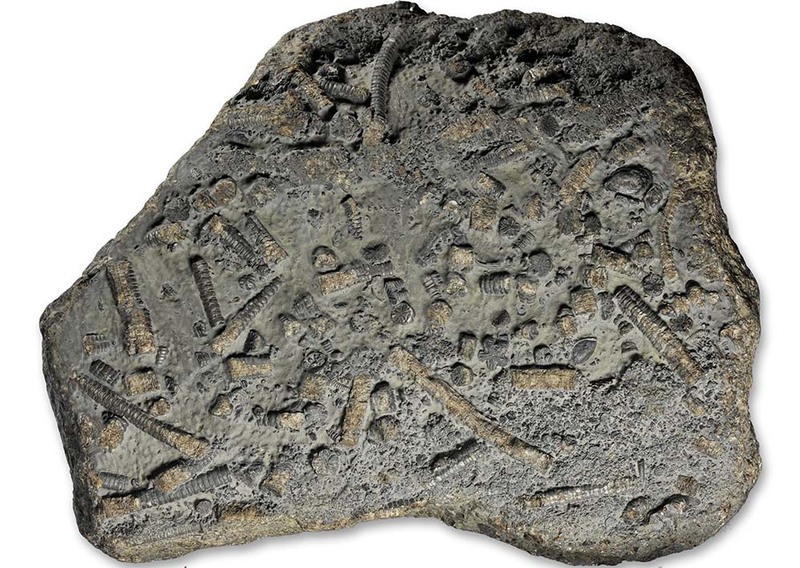 On the inside, this lens consists of almost 100% of crinoid ossicles amalgamated into a solid calcitic core. 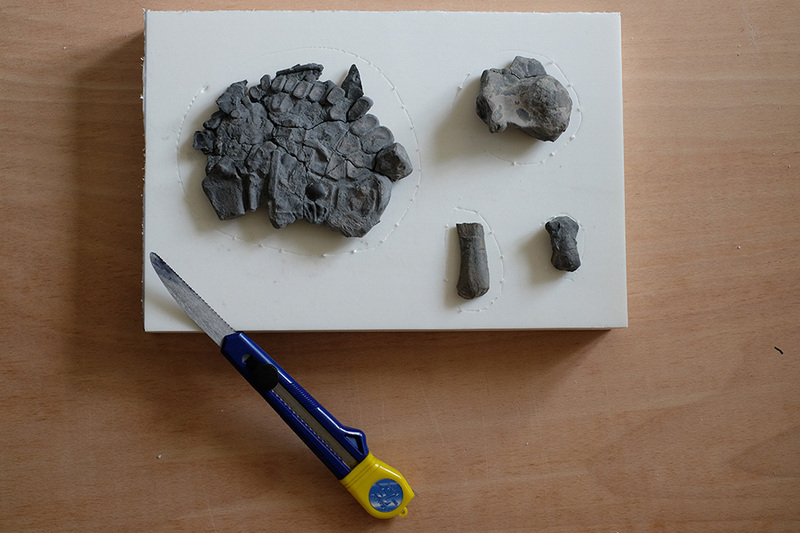 specimen using potassium hydroxide pellets over the course of a couple of weeks, the final touchers were again made with an air abrader. 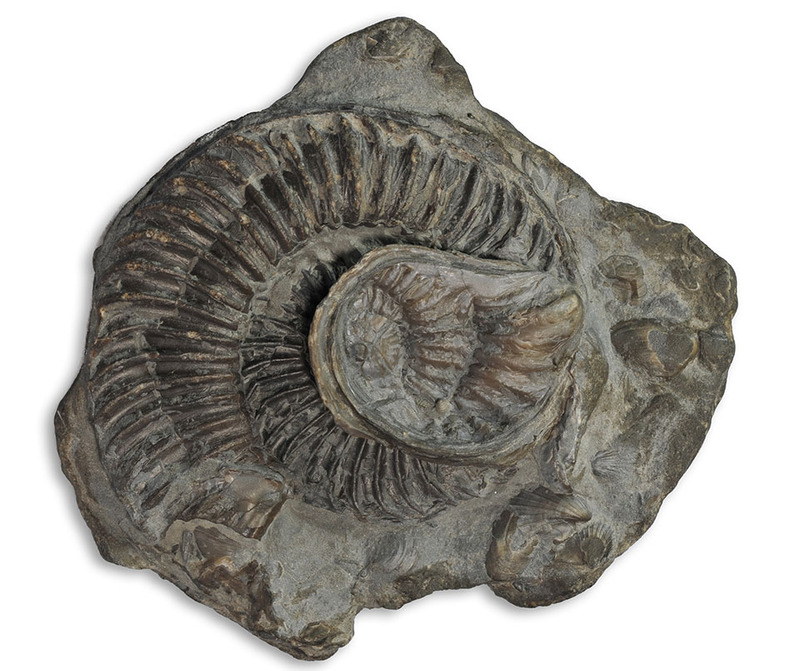 This specimen also handily shows a Dactylioceras tenuicostatum ammonite on the back of the nodule which tremendously helps dating it ! 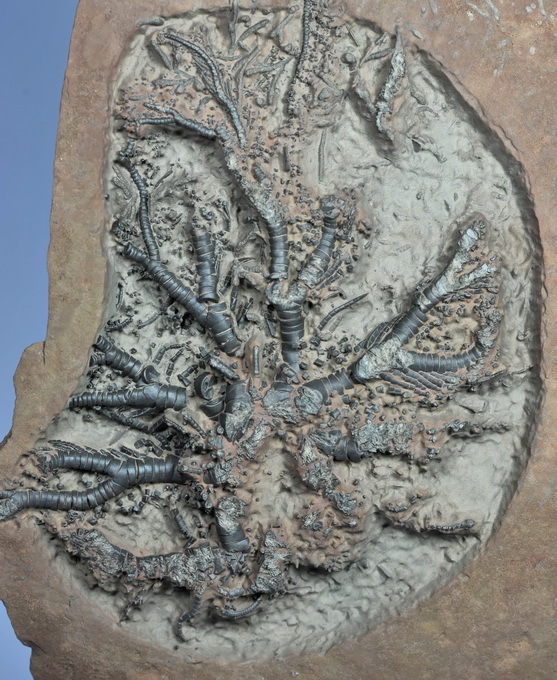 This crinoid was a surprise find on my birthday this year ! 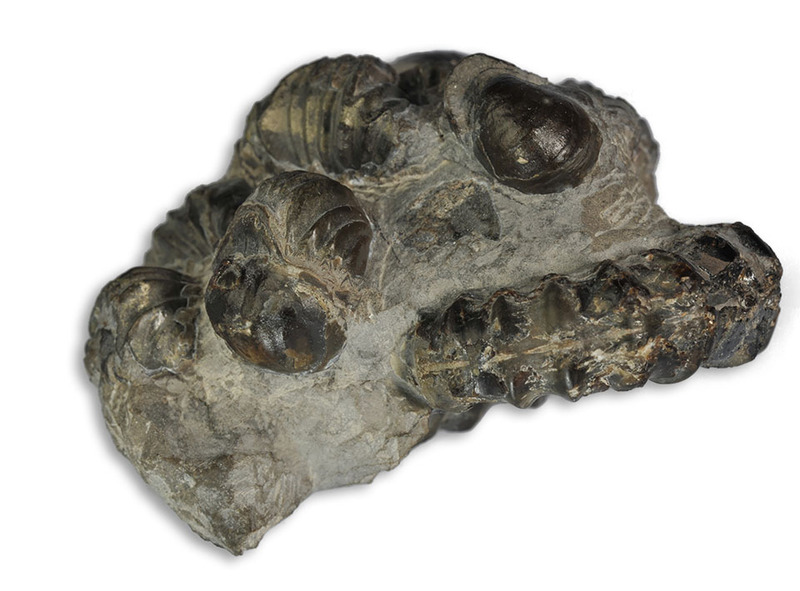 It sat neatly on the edge of a fallen rock most likely of oxynotum zone age and when found I had thought it was a Hispidocrinus in an unusual, almost 3D preservation. 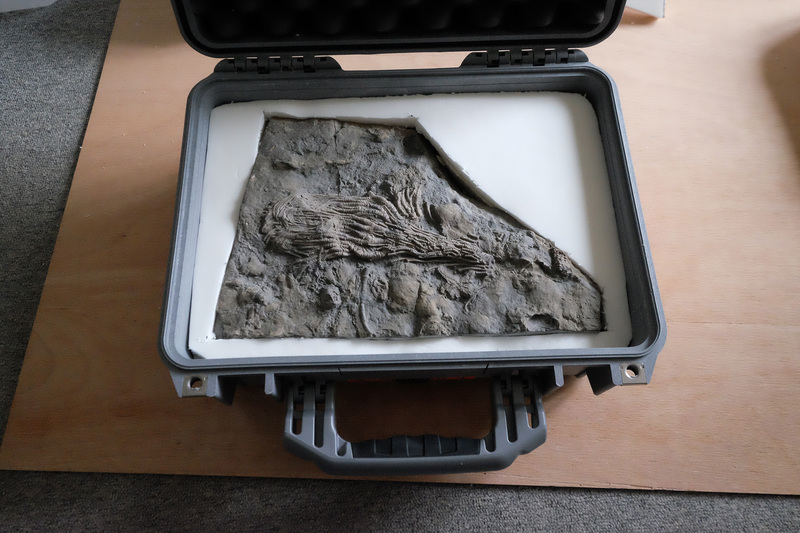 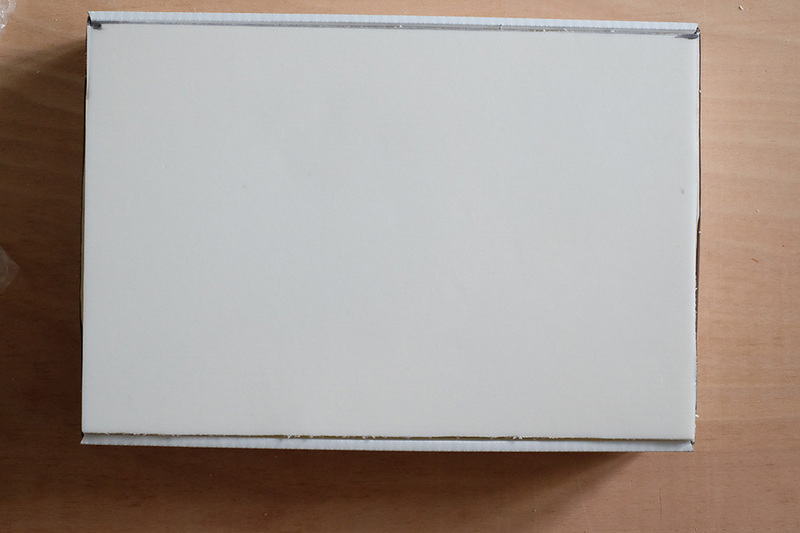 The surprise came at home when I prepped it using the air abrader and noticed that it did not have the characteristic spines of a Hispidocrinus. 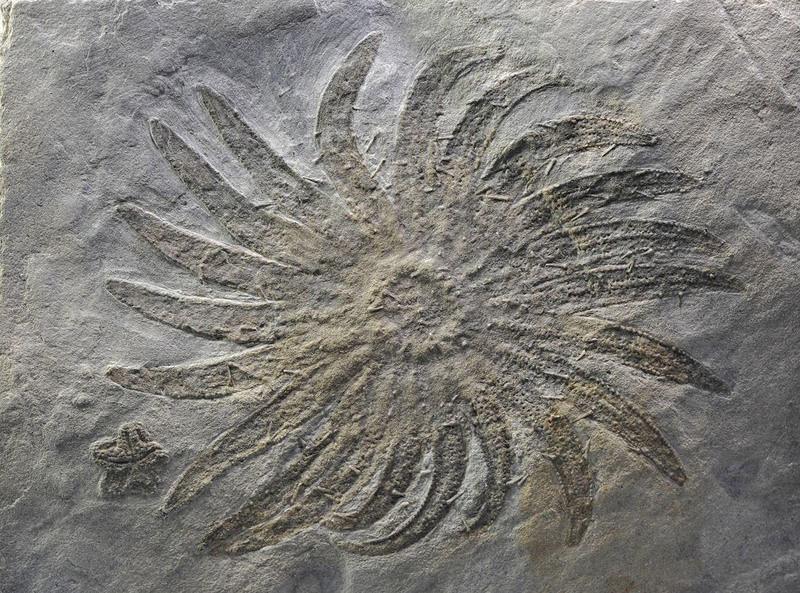 Dr Mike Simms kindly identified it as an early Isocrinus robustus. 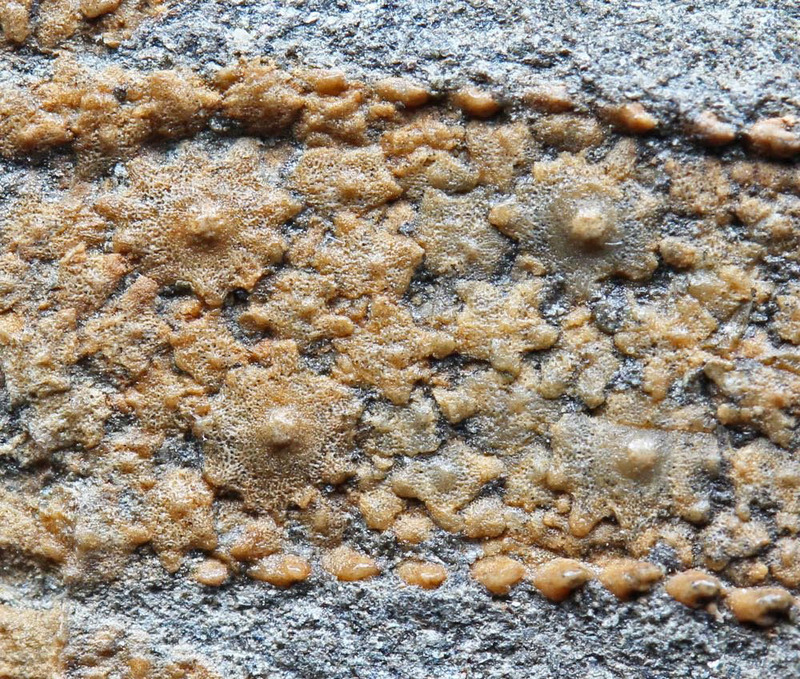 This beautiful colony of Pentacrinites dichotomus from the Jet Rock in the Whitby area was found by Mike Marshall who prepared it by stabilizing the exposed weathered side of the thin fragile slab with a layer of epoxy putty and prepared it from the other side using an air abrader. 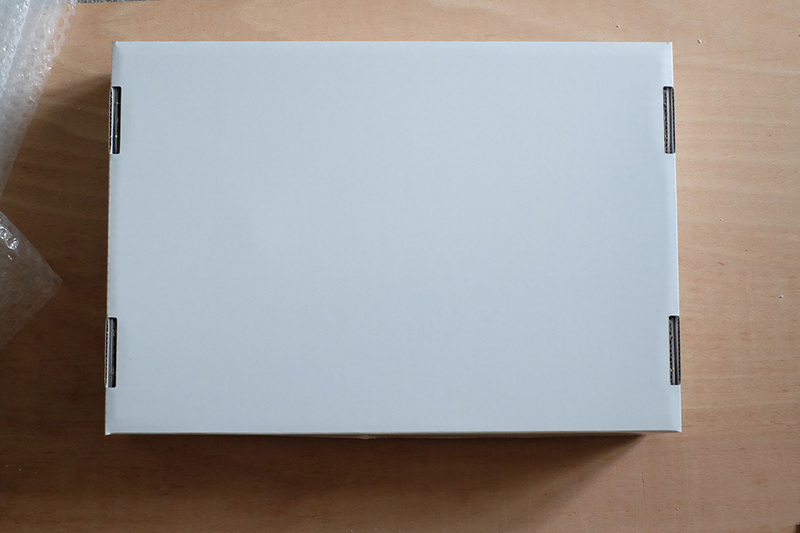 The colony is nicely set into a slab of top jet dogger to stabilize it. 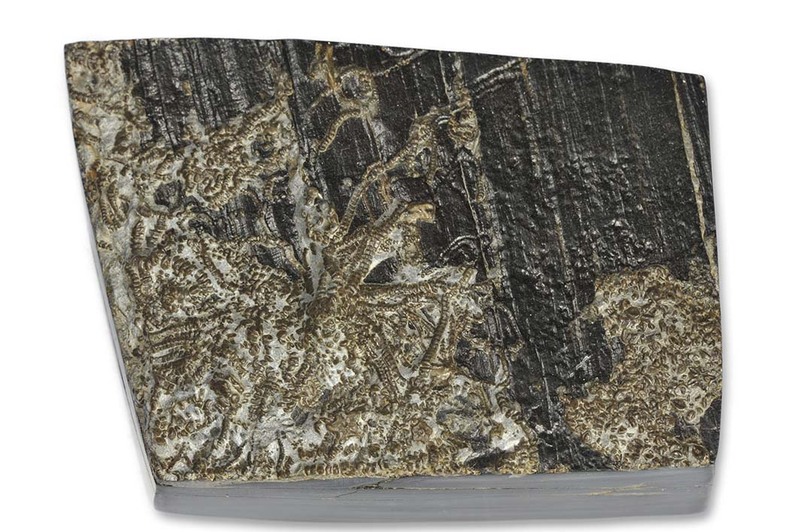 This beautiful section of a piece of solid black jet with a juvenile crinoid anchored to it was kindly given to me by a friend. 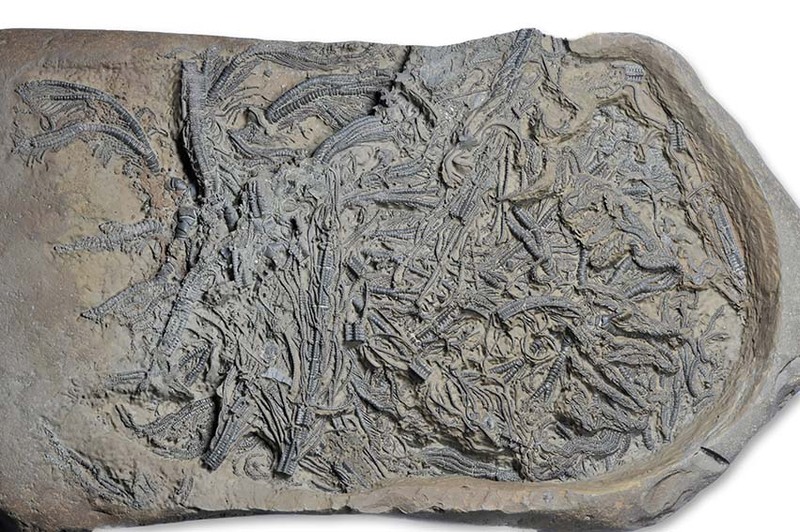 It gives more evidence to the observation that some crinoids have used floating logs for anchoring themselves to during their lifetime and filter fed in the surface waters. 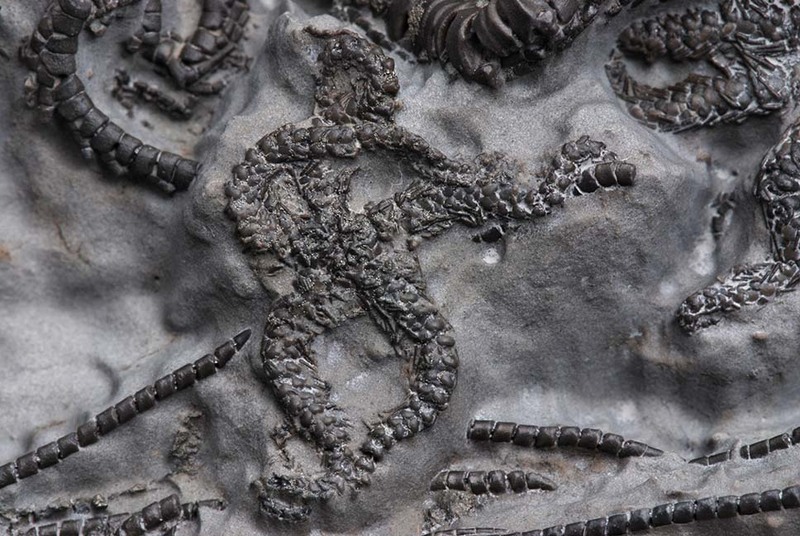 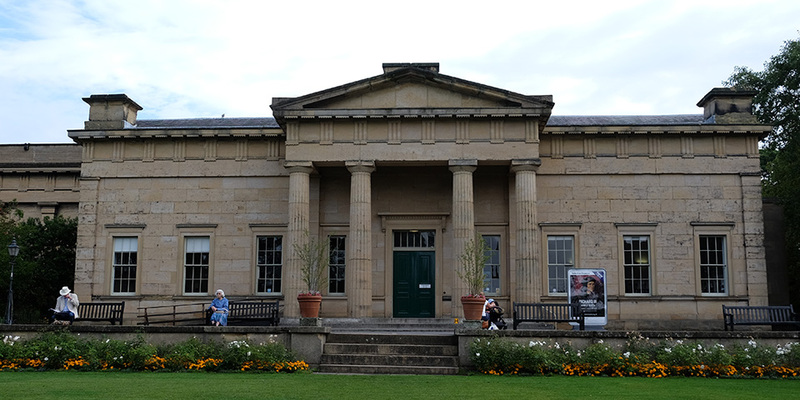 Have you spotted the crinoid remains on this picture ? 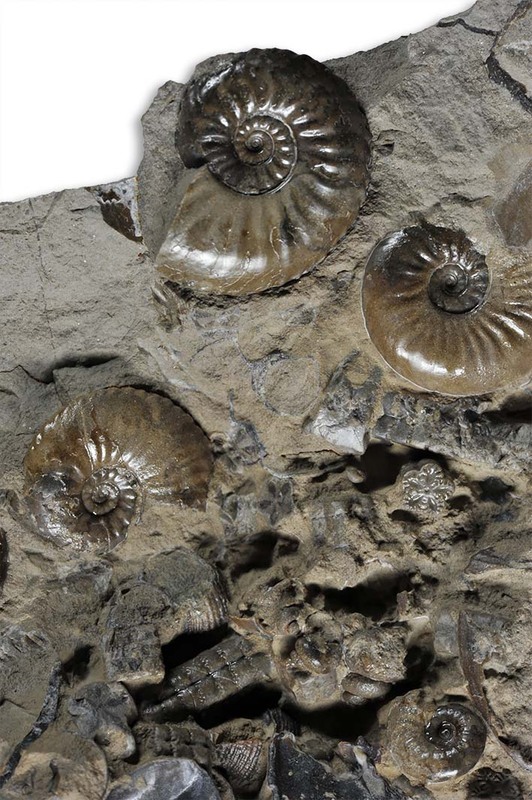 – don´t get distracted by the associated juvenile (~1 cm ) Amaltheus ammonites ! 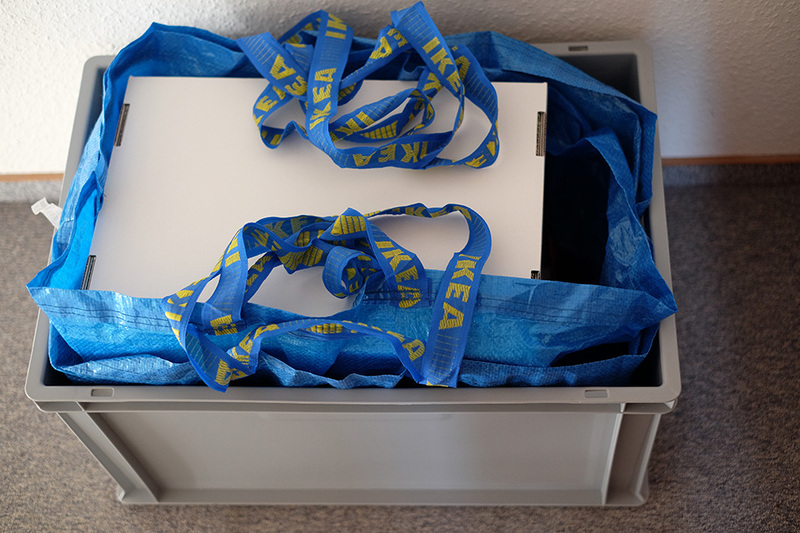 Of this one I yet have to find a crown. 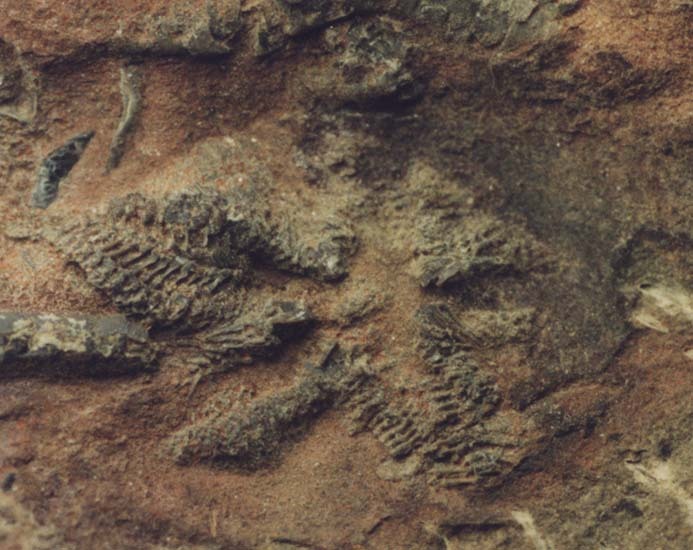 Disarticulated ossicles are no rarity in the stokesi and maculatum subzones, but sometimes extraction can be impossible. 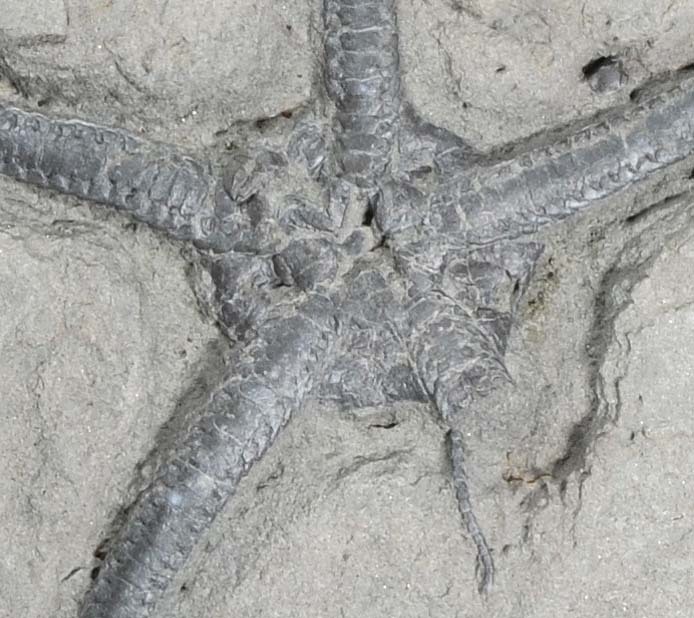 The second part describing the starfish will be published next.